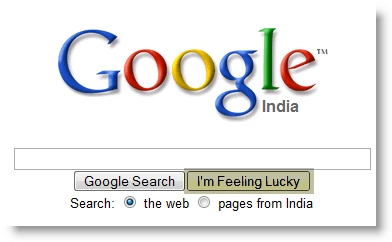 The I'm Feeling Lucky button available in Google Search page takes users directly to the first web page Google returned for a search query. This excellent features save time and number of mouse clicks for users. If you are not aware of this feature you can try it out by typing Yahoo in Google Search page input box and clicking on I'm Feeling Lucky button. This search directly takes you to Yahoo home page instead of displaying the search results which matches to the keyword Yahoo. Sergey Brin, cofounder of Google say around one percent of all Google searches go through the I'm Feeling Lucky button. As the button directly takes user to first result page, Google can not show search ads on the one percent of all its search results. That costs the company around $110 million every year.